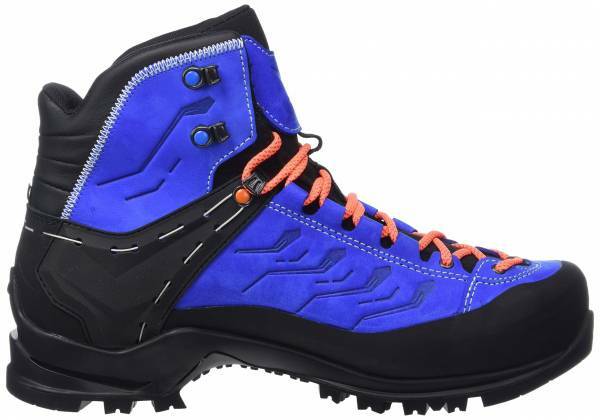 Droves of users praised the Salewa Rapace GTX for its superior lightness. This boot impressed dozens of mountaineers with its jaw-dropping comfort. One of them linked this amazing level of comfort to the boot’s ability to flex during transitions. Quite a number of wearers raved about the Rapace GTX’s true-to-size fit. Some owners were delighted to find out about this boot’s almost non-existent break-in period. They used the boot straight out of the box and, after covering a few miles, came back blister free. The Salewa Rapace GTX’s climbing performance is simply extraordinary, based on a few user reviews. The overall sturdiness of this boot impressed a few owners. Evident to this quality durability is the footwear’s layered upper, complete with a full-on rubber rand. A small percentage of users applauded this boot’s crampon connection for working surprisingly well with their aftermarket crampons. A couple of customers felt compelled to give the Rapace GTX great remarks for its excellent ankle support. According to a very few, this boot’s waterproofing feature is criminally underwhelming. One of them said his feet got wet for merely walking through some wet bushes. A hiking blogger felt betrayed after discovering the shoe’s outsole has worn out too quickly. People who are in search of an exceedingly comfortable mountaineering boot, one that doesn’t disappoint when it comes to climbing performance may look no further as Salewa’s Rapace GTX more than fits the bill. It is also a footgear with surprising lightness and true-to-size fit. Sadly, some users smear the boot’s rather flawless resume by decrying its letdown of a waterproofing feature. Overall, barring its disappointing water protection, the Rapace GTX has a lot going for it that puts it on quite a lofty pedestal. This boot gives a ton of performance in a compact, lightweight package. And we love it! If you're looking for boots for technical hikes, you should check them out. Built on the 3F System for flexibility, ankle support, and precision fit, the Salewa Rapace GTX is a mountaineering boot that is undeniably packed with features from top to bottom. Its above-the-ankle upper is made of nubuck leather shielded with abrasion-resistant fabric and rubberized walling. It is lined with a breathable Gore-Tex membrane that not only protects against water, but also wicks away sweat and moisture. This revamp sees the return of the Y-shaped cable which wraps around the heel of the boot. This cable, as more pressure is applied on the laces (particularly the ones fastened to the hooks just above the instep), constricts the heel zone, and, as a result, gives the boot extra ankle and heel support. The crampon connection at the base of the heel received a minor update. It is more streamlined and less conspicuous design-wise compared with the previous version. The Vibram outsole providing the boot its traction has been updated in this model as well. The aggressive lugs bordering the sole unit are more angular than the last, and the multi-directional protrusions at the center have doubled. The Salewa Rapace GTX is a fairly true-to-size, mid-cut mountaineering boot for both men and women. It comes in standard width and is offered in a number of different sizes. The ladies' version is built with a female-specific last to deliver a fit based on the unique contours of woman's foot. The boot’s lacing system provides custom lockdown and allows for dialed in configurations all the way down to the toe box zone. Aside from additional heel and ankle support, the Y cable mechanism also creates a more compact cradle for narrow-footed folks as the laces are tightened just above the instep. With Vibram’s Wrapping Thread Combi (WTC) outsole, wearers are promised a kind of surface grip that works over different types of terrain. It has aggressive treads that marry quality traction with clever engineering, one that promotes natural ground feel with every step. The multi-angular lugs dotting the central part of the outsole are designed to provide and maintain traction from practically every direction. The lugs found at the end of the forefoot zone are positioned in such a way that aids wearers during climbs where precise forefoot placements are required. Aside from providing traction, this Vibram outsole also reinforces the tip of the forefoot by extending slightly towards the upper. This rubber tip minimizes shock when step-kicking on hard surfaces. The Rapace GTX’s midsole is charged with Salewa’s Bilight technology. It is mostly made of TPU or thermoplastic polyurethane, making it resistant to compression, impacts, and abrasions. This midsole also has a stiff part which is made with a combination of nylon and 27% fiberglass. Its lasting comfort is thanks to its ergonomic design and ample cushioning. It dampens shock with its extra thick heel zone and highly contoured arch. Toe-offs are also assisted and more convenient due to the midsole’s tapered construction. On the back of the midsole’s heel is a groove called crampon connection which makes the Rapace GTX compatible with C2—semi-automatic crampons. On top of the cushioning primarily provided by the midsole unit, there is also the boot’s default insole—the Multi-Fit Footbed Plus (MFF+). It has two yellow layers that are interchangeable, allowing the boot to accommodate different widths. This removable insole is made of a cushy foam material. The Salewa Rapace GTX has a 1.8 mm nubuck leather upper covered with wear-resistant fabric and durable synthetic overlay. The 360-degree protection from abrasive elements is made possible by the rubber rand that runs across and around the upper’s base. The interior is both breathable and waterproof, thanks to the Gore-Tex Performance Comfort liner. While the lower part of the upper’s heel is hardy and supportive, the upper area is engineered to be flexible, allowing wearers to perform maneuvers with as much ankle freedom as possible. The laces that give users a secure fit and personalized lockdown are made up of synthetic threads entwined together for durability. These laces pass through a combination of different types of lace holes—standard eyelets at the bottom, synthetic tunnel-like loops at the middle, and metallic open hooks at the top. The Y-shaped cable hugging the upper’s heel is made of a wire-like material. Both of the Y cable’s ends are attached to the pair of metallic lace hooks situated just above the boot’s instep.